When you have a newborn, the first thing that strikes you is their beautiful and fragile skin. 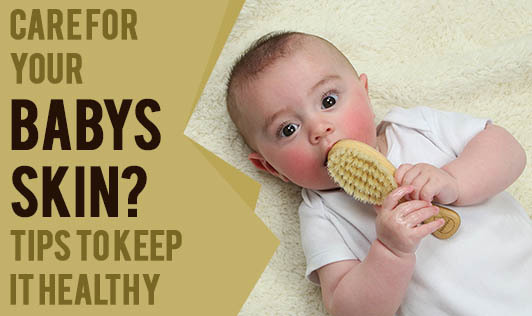 No doubt you love your baby's soft, sensitive and delicate skin, but do you know how to take care of it? 1. Baby acne: It is very common at birth and may appear on the cheeks, forehead, chin and back. It does no harm the baby, and generally goes away on its own. But, if you notice the acne to be long lasting or severe, speak to your doctor and they may prescribe a mild topical medication. Do not use any over the counter drugs, oils, creams etc. 2. Nappy rash: Some Babies have red skin around the diaper area. It occurs if the diapers are too tight; wet diapers left on for too long; or due to a reaction with a particular brand of detergent, diapers, or baby wipes. 3. Eczema: It is an itchy, red rash condition and is common in children who have a family history of asthma, allergies, or atopic dermatitis. Eczema may occur on the baby's face as a weepy rash. 4. Dry skin: It appears if your baby is born a little later than the expected due date, but the underlying skin is perfectly healthy, soft, and moist. 5. Jaundice: It usually occurs 2 or 3 days after birth. It is a yellow coloration that affects the baby's skin and eyes that is due to too much bilirubin. Treatment for jaundice may include more frequent feedings, and for severe cases, light therapy. 6. Prickly heat: You may notice some small pink spots all over the body of your baby. Keep your baby in loose clothing and avoid keeping them in areas that are too warm as this could make the problem worse. 1. Wash all new clothes and linen before your baby uses them. 2. For the first few months, do your infant's wash separate from other laundry. 3. Use a gentle detergent to wash everything that touches your infant's skin, from bedding and blankets, to towels and even your own clothes. 4. Apply oils and lotions, especially during winter to help replenish moisture in your baby's skin, and relieve problems with irritation. 5. Use branded soaps, shampoos and talc to prevent skin irritations. Share your tips on how you take care of your newborn!